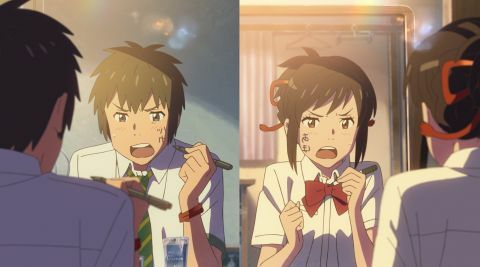 Your Name review: "Shinkai's giddy romance brims with emotion and invention"
Prepare to be spirited away. A brain-scrambler to make hearts swell, Shinkai’s giddy romance brims with emotion and invention. Once he’s got us on our toes, Shinkai keeps us there. The outer-body premise is well-milked for gentle humour to start – Taki becomes fixated on his newfound breasts – but the playful pitch doesn’t swamp feeling. Raised in an environment of tradition, Mitsuha pines for city life; Taki, meanwhile, wrestles with the tragicomic inarticulacy of adolescent masculinity. Smartphones are cleverly used to co-ordinate the plot-lines, a co-ordination given a metaphorical parallel in the cords Mitsuha is tasked with meticulously braiding. Adding more flavours, the end stretch recalls Wong Kar-wai’s rainy-day romanticism in its mix of sliding doors and deferred liaisons. A satisfying conclusion seems like too much to expect from so rich a weave, but Shinkai’s careful weaving of poignancy, plot threads and metaphor delivers one. For Mitsuha and Taki, the outcome is best experienced, not explained. For animation fanciers new to Shinkai, it could be the beginning of a beautiful relationship.